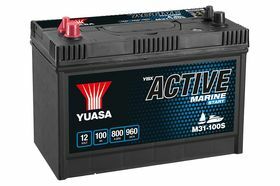 M31-100S Yuasa Marine 12v 100ah Battery From County Battery Services.Order online before 2pm for same day process and dispatch. Yuasa MarineLine M31-100 semi traction battery provides safe and reliable power for marine use. Use as a starter battery for an outboard engine; as a battery to supply the electric system; or as a power source for most marine-craft appliances. A high quality, high powered battery, crafted with the latest technology for modern day marine needs.